The best way to get to know a community is by scheduling a tour. See the facilities, meet the staff and residents, and get a feel first hand what it's like to live at First Choice Companion Services LLC Home Care. At First Choice Companion Services, Our mission is to be your premier provider of and In-Home Care services by always striving to offer your senior parents or family member the highest quality of life and independence. We are Seniors advocates committed to providing health care that looks beyond the obvious needs of seniors enabling them tom live their homes as long as possible. We focus on achieving desirable and timely clinical outcomes. We are good communicators who respect the needs of our patients and their families. We build a high trust environment where people are valued. We all participate in growing the business. We respect our patients’ families, referral sources, caregivers, payers, competitors, and each other. We act with unquestioned integrity. At First Choice Companion Services the difference start here with our Senior Advocacy Philosophy. to address the challenges facing our aging population in a revolutionary new way. Our clinical team looks beyond the obvious needs of our patients to become advocates for their physical, mental and emotional well-being. Whether term illness, we can provide highly skilled and compassionate care. Our health team include: Physical, occupational and speech therapists, to increase the patient's strength, mobility, safety and communication; medical social workers to identify resources and offer counseling and support; dieticians, and other specialists. Our founder, Mr Enos Jacques has more than 10 years of Business experiences. Formerly the head of our Nursing Agency and our Office Manager is working in a large metropolitan hospital, she decided to create a one-stop-shop for families looking for online solutions to their health issues. Through our Nursing agency. Mr Jacques hopes to provide quality services in our Community to those in needs. 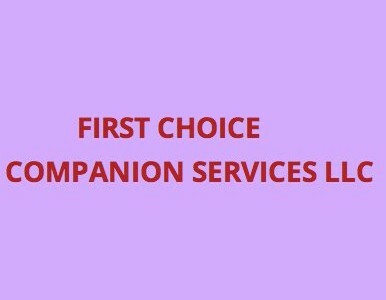 First Choice Companion Services LLC is here for you, and your family. We are currently servicing Palm Beach County, St Lucie County, Martin County and Indian River County. Please contact us today for Free In-Home assessment.